Going to the lovely island of Langkawi, Malaysia, or perhaps to sample the food in the UNESCO world heritage city of George Town on the island of Penang? Langkawi is a great island to start or end your trip to Malaysia. It has many fine beaches and a very relaxed vibe. My overview on what to do and where to eat in Langkawi plus don’t forget my general Asia articles for how to travel in my favourite region in the world. For zen-like luxury and seclusion but not isolation, your best choice is the Ambong Ambong Rainforest Retreat. My review. Animal lovers will love Bon Ton and Temple Tree resorts, affiliated with the LASSie animal shelter, which rescues and rehabilitates animals in need. My review. The Danna Langkawi pampers guests in luxury and has phenomenal customer service. My review. 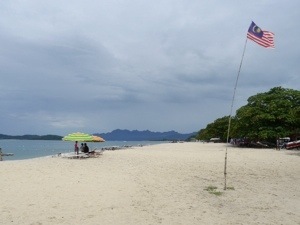 Pantai Cenang beach is the place to be in Langkawi, but it can get a bit busy. If you want to be near the action, but not in it, stay at Villa Molek, a tranquil boutique hotel. My review. Always wanted to stay on a private island? The Rebak Island Resort – A Taj Hotel is on a small island just off Langkawi — it is the tropical version of the Fairmont Jasper Park Lodge in the Canadian Rockies. My review. There is a lot to do in multicultural George Town, a city filled with great food, UNESCO world heritage buildings and street art. My mini guide helps differentiate the sites and tastes whether they are more colonial or more diversely Malaysian. 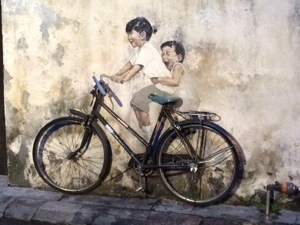 Or, if you’re bringing the kids, my guide to keeping kids entertained while learning about Malaysia and Penang. George Town’s Hotel Penaga is a beauty, and brings more beauty to the world by truly making efforts to protect the environment and by hosting an artists-in-residence program. My review. Hotel Penaga is a sustainable hotel which I’ve also written about for The Wayward Post, Stay in this sustainable boutique hotel in Penang, Malaysia. A thorough conservation project brought 23LoveLane from near-ruin to heritage boutique status, and you can stay in one of its large airy rooms (unusual for George Town). My review. The PARKROYAL Penang Resort, at Batu Ferringhi (Foreigner’s Rock), is a nice family resort on a golden beach (and with waterslides!). My review.